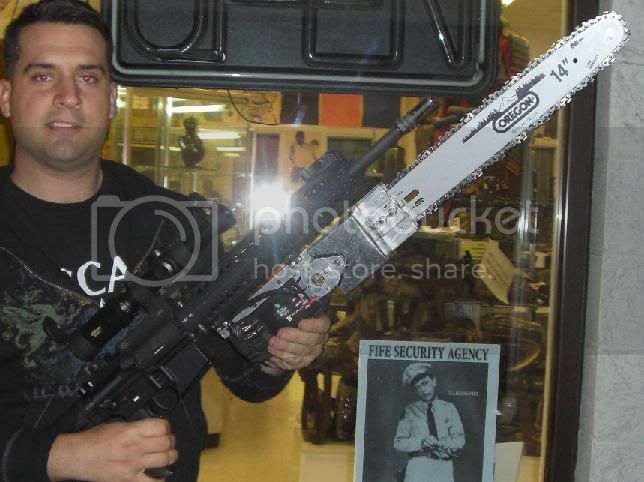 Well, as you can see, the chainsaw is kind of an either/or proposition. Bob was asking what Amsdorf was going to do with all those empty rails (jokingly), so I showed him (jokingly also) what was possible with that "cute" rifle. But yeah, a chainsaw is possible too. But it's only a 14". A real gun would have a 36" bar. Haha! I've got a smaller 3-12X 42mm Nikon with BDC600 reticle on it now. That flashlight is a very powerful Fenix. It stays on permanently, when the red dot is on it, and bipod is off. It works nicely with or without my scopes. I think most would run if they saw it unless they were armed. But I have a different solution that weighs less. It is called a polesaw and mine has a 14" bar.